The Rosemary Greyhound is an old fashioned cocktail livened up just a touch with an herb but is still the tart and sleek Greyhound of old. Just three ingredients make for a lovely refreshment that is fantastic all year round. When citrus season hits, I want to make everything possible that incorporates lemons, lime, oranges, and grapefruits. The first three get their due in my kitchen but I admit I too often forget the grapefruit. I do love it but if I’m honest I’ve also hated that business about cutting all those sections before serving it and that has kept them at the bottom of the totem pole. Not today; today all that was necessary was juicing and slicing and I can do that! 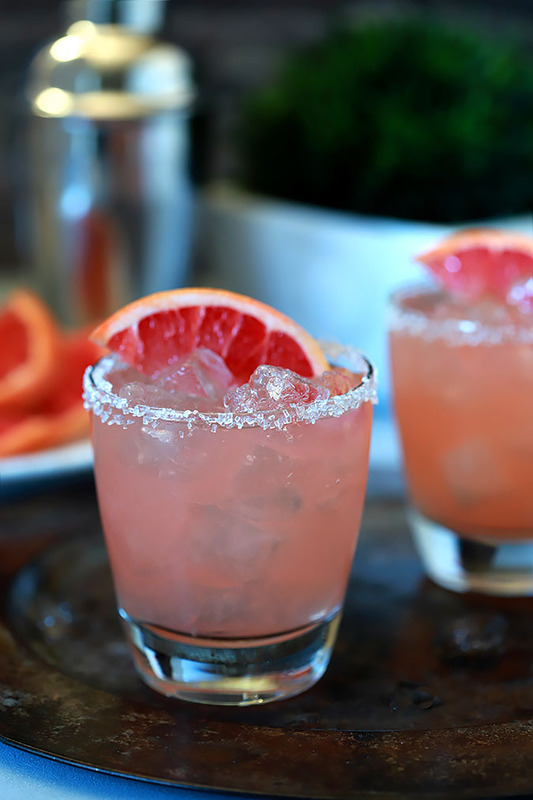 Besides; did you know it’s National Grapefruit Month…how could I not? To tell you the truth, I don’t think I’ve ever included the basic Greyhound Cocktail in these pages but I really loved the hint of rosemary so much I don’t know if I’ll ever go back. If you are not in the same camp and you feel like you’re eating or drinking a Christmas tree whenever Rosemary is involved, simply omit it from the recipe. While I did rim this drink, which may not be standard practice, it’s simply sugar. If it were rimmed with salt it would be called a Salty Dog. I don’t put sugar on every rim but I do love how they add some texture to photographs and since this was a tart drink, it worked beautifully. The truth is, Wilton Cake Decorating Sugar is more decorative than it is another taste element; it doesn’t melt in your mouth like regular sugar but it sure does look pretty doesn’t it? I have several jars of different colors…and I’m not sure I’ve ever used them on a cake but they are fantastic for decorating cocktails and my favorite sugar cookies too. As an aside the recipe might call for rosemary sprigs for garnish. Oops…my cocktail has none. But I have a good excuse! I saved the little, charming rosemary plant someone gave me for Christmas shaped like a Christmas tree. I’ve re-potted it and it’s thriving but it doesn’t quite have sprigs yet; the way they shape those plants into trees makes for VERY short branches. I’ve got tons for using in recipes but nothing quite long enough for a nice garnish. But don’t let it stop you…if you’ve got some, it’s pretty either by itself and with the grapefruit section. As for the grapefruit? Try to find some of the Red Ruby variety; they have such beautiful color to them. I love using my citrus juicer for juicing them too; makes for quick work and I’m sure extracts more juice too. 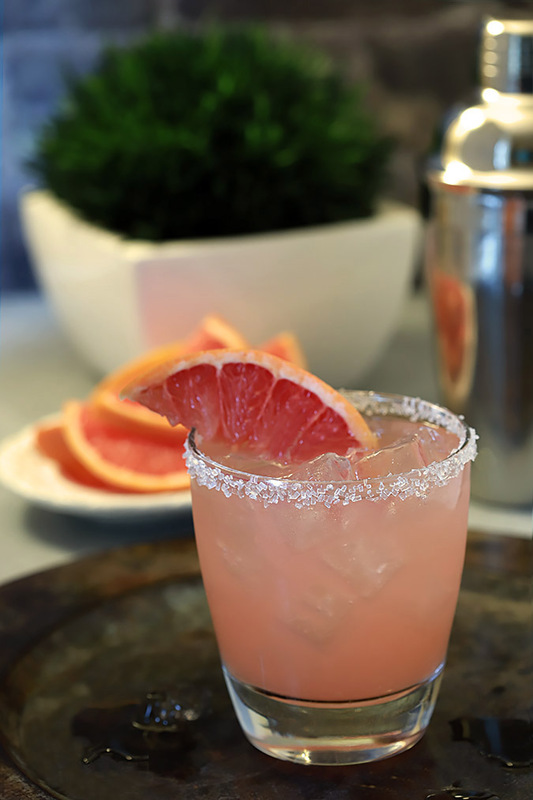 Now go grab some of those luscious grapefruits at the market; this one should be a regular in your cocktail rotation and of course, Cheers! In a small sauce pan over medium heat, heat the water and sugar until the sugar dissolves. Add the rosemary sprigs to the sugar water and let them steep for at least 1 hour. Fill a shaker with ice and add the vodka, rosemary simple syrup and grapefruit juice; shake until ice cold. Pour over the ice in glasses and garnish with a sprig of rosemary and or a grapefruit wedge. I like rosemary, and we grow it every year in our herb garden. So I may wait to make this one until the weather warms up (and although it’s citrus season now, this looks like a great summer drink, too). I’ve not had this, and hadn’t heard of it (although I do know the Salty Dog, of course, and this looks like a fun variant). Good stuff. 🙂 Thanks!